Nike have unleashed a stunning new collection of Barca training wear for Messi and co. to wear until the end of the season- and it offers a perfect match for the recently-released ‘Born’ Mercurial. There’s no arguing that Ciutat Esportiva is one of the most iconic footballing facilities currently in existence. As Barcelona’s training camp, not only does this place offer the backdrop for the Catalans’ match day preparations, it also serves as the development centre that produced players such as Andres Iniesta, Xavi and Lionel Messi. As far as youth development goes, you couldn’t really hope to achieve much better. When you consider the unbelievable football Barca play and the astonishing talent they’ve produced in recent years, it’s really no surprise that Ciutat Esportiva is so highly regarded within the world of professional football. Ever since it first opened in 2006, this is the place that every world-class player dreams of training to develop their careers. We can just picture it now: Lionel Messi practising his silky dribbling, Luis Suarez perfecting his finishing and Sergio Busquets intercepting every loose ball going. Hosting some of the best talent in world football, we bet that Ciutat Esportiva is a sight to behold during training sessions. Well, now that picture is going to look even more impressive, because the ‘Blaugrana Boys’ have been busy showing off a brand-new collection of training wear from Nike this week. As they seek to mastermind their way to La Liga and Champions League glory, Barcelona will be sporting the new collection from now until the end of the season. The dazzling shades of orange used within this year’s Barca away kit features prominently in the new designs, with vibrant patterns on the sleeves of both the VaporKnit shirt and zip-up top. The famous Barca crest sits prominently on the chest on these new designs, standing out beautifully against the dark navy colourway. This new selection of Barca training wear comes alongside the release of the FC Barcelona Tech Pack, which has been shown off by striker Paco Alcacer in Nike’s promotional material. These smart fleeces and joggers feature a subdued grey colour, alongside those orange details that have become synonymous with the Catalans this season. Nike are giving Barca fans everything they need to look good in training, on the street and on the pitch, as this smart collection is perhaps one of the most stylish we’ve ever seen. One thing’s for certain: it just doesn’t get much bigger than Nike and FC Barcelona. 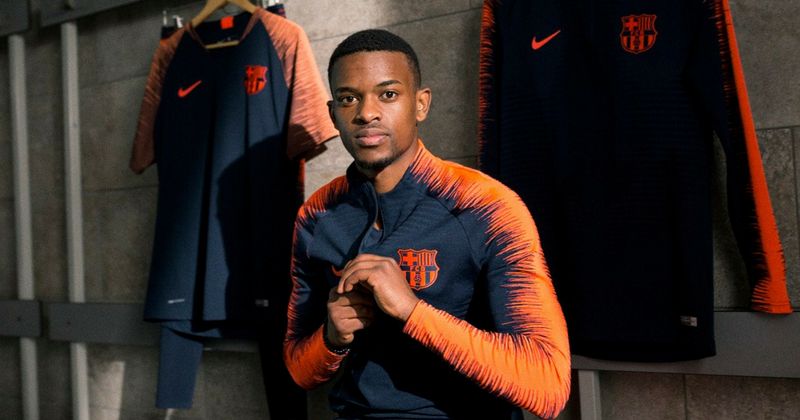 This partnership is highlighted even further as right-back Nelson Semedo steps in front of the cameras, adorned in the new training wear and sporting a pair of the new ‘Born’ Mercurial boots. All you have to do is take one look at that outfit, and you can see that it’s a match made in heaven. The “Total Orange” colourway used in the ‘Born’ Mercurial is mirrored in the details of the new training wear, complementing each other off the pitch as well as Messi and Suarez do on it. It’s a perfect embodiment of the boldness of Barcelona’s play and the slick style of Nike’s innovative designs. In short, we like it a lot. But what do you think? The new Barcelona football training wear is available from Nike right now, and we’ll soon be helping you to find the best prices on FOOTY.COM!